If you hear the term "field Poodles", you may think of hunting Poodles, who usually are working near the water, retrieving ducks. 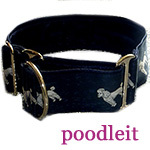 If you have interest in working lines Standard Poodles, I would recommend you check out Louter Creek: http://www.redhuntingpoodles.com/. My friend Kim Tyndall has recently purchased a Poodle from them and gives them the highest of recommendations. Also, they are the ones who had a red Poodle featured on the TV show many folks love - Duck Dynasty! Red Standard Poodles are very appealing, but if you have interest in this color, please don't just google the internet, please make sure you are working with an ethical breeder who does all the health clearances recommended. It is very easy for unethical folks who are simply taking advantage of something unique (just like the parti colored Poodles that are fascinatingly beautiful) to take advantage of puppy buyers through the internet. Please recognize that this wonderful breed of dog IS definitely plagued by some health problems, so it is EXTREMELY important to check out the breeder thoroughly before you invest. On a brighter note, the Poodles above however are simply enjoying a field outing in Heber City, Utah (pictured with Melanie North). Some are owned and loved by Heather Bryan of Prodigy Poodles, who captured this special moment in time. Heather is the breeder and co-owner of our beautiful new pup Hudson. Just like those pictured above, keep in mind that your Poodle, of any size, is a DOG who will greatly enjoy the outdoors wherever you can find a safe area for exercise and socialization. 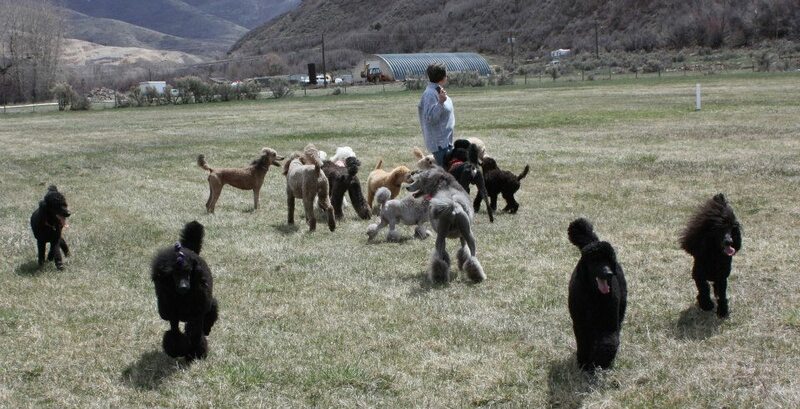 I am not overly fond of dog parks (although some are well run and safe, I think most should be approached with caution) but Poodle parties and outings, where owners meet and let their dogs run with one another, are great fun. I've been to a couple and I had one at Bed & Biscuit years ago, plus we had a weekly socialization class for Standards for a year or so. Dogs are interesting in how well they interact with "their own kind". 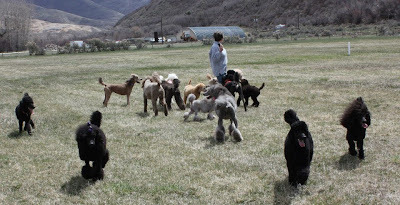 We had lots of fun at our Poodle outings and weekly classes and so did the dogs. There was one German Shepherd who joined our group. She was so funny, different from the Poodles, as she would keep an eye out for any misbehavior that needed to be corrected and would march right in and "correct" the young Poodles, simply with her body language by walking in between the dogs to break up anything before it got out of hand. We called her the Poodle police! She was the lovely Elka, who was owned by Pam Gaynor. Elka, we will never forget you...your memory lives on, as an honorary Poodle! If you would like to read about Elka, please visit an article about her amazing Hospice work on the Knowing Dogs blog: Elka, Therapy Dog of Excellence. Many thanks to Heather Bryan for sharing the above photo of "Poodles having fun in the field!" Well, I confess. In the Poodle world, I am now 100%, totally, completely politically incorrect! My first Standard Poodle was politically correct .She was purchased as a pet, at the age of six months, from a show breeder who did not wish to keep her because her bite went undershot. We spayed her as soon as we got her home, we loved her, we socialized her and she became an excellent therapy dog who enjoyed nursing home visits as well as helping me with educational programs at schools (for children of all ages). Her name was Figi. We adored her and as best we could tell, she felt the same about us! 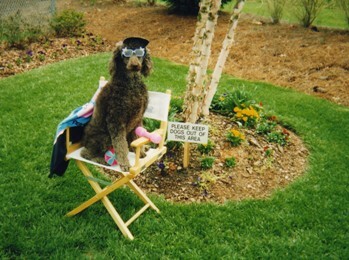 Figi in her director's chair in front of the sign that says "Please keep dogs out of this area!" 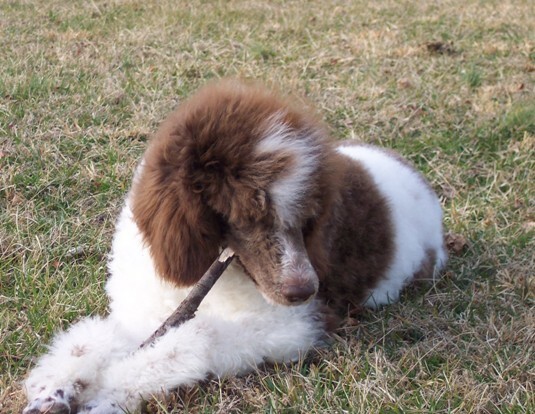 During Figi's years with us, other Poodles came and went, because we began to search for a nice Standard Poodle to show, and in addition, we became involved in poodle rescue. A lovely white boy named Teddy was with us for a short time, then went on to become a certified Therapy Dog for a dog trainer and behaviorist who worked with us for over seven years, Judith Rock-Allen. A few rescues almost stayed permanently, in fact one was taken in from a breeder who had gotten older, who had dogs she had gotten personally from Wycliffe kennels. He was a huge black boy with beautiful movement and a happy personality. But none of these dogs could match the very special qualities we saw in Figi. We knew, from her health issues, that she would not be with us for an extremely long life, but when we did lose her, just under the age of 11, we still weren't prepared. We had a little miniature Poodle but no other Standards to keep us company. It was then that we purchased our "Lizzie", from a show breeder who valued the Wycliffe lines, which we had read about, because of Jean Lyle's tremendous influence on the breed. But at that time, we had not read John Armstrong's research, which showed that the many of the Wycliffe dogs had serious health problems, and yet continued to be bred. So we did not know that we were ultimately be heartbroken by buying show dogs from a breeder who still held on to, and in fact, bred very tightly on, bloodlines that were full of problems such as gastric torsion, Addison's disease, blood clotting disorders and even seizures. In fact, before Lizzie was two years old, we purchased a second dog from the same breeder. Lizzie died of lymphoma when she was just under the age of 7. 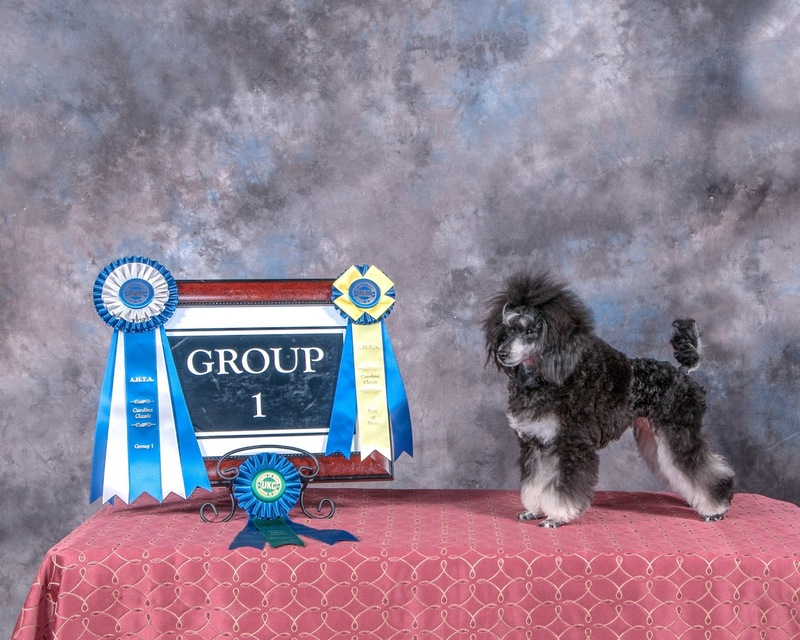 By that time, we had met show breeders who were members of the Poodle Club of America, who taught us about the value of out-crossed pedigrees, to try to get away from some of the serious problems in Poodles. We had also, however, been taught that three of the most important things in a evaluating a Poodle are - coat quality, head type and COLOR. Above all, solid color was very important, if one wished to ever have a Poodle worthy of walking into the show ring. This was all news to us at Meja,because we had been showing Siberian Huskies since the late 70s. Siberians are a working breed, and strucure and efficient movement are much, much more important than the color of a dog. In fact, dogs with any type of markings can be shown in the Siberian ring, and dogs of any color. Sure, some judges will only put up a traditionally marked dog, we had, by the time we got into Poodles, knew of people who were winning in the show ring with Siberian Huskies who were not of the traditional black and white, blue-eyed variety! We still have a black Poodle, "Kate", who is almost 11 years old, who came from a breeder who loves the Wycliffe Poodle lines, despite some of the problems she has encountered. Out of respect for that breeder, I will not list all of the health problems that my dogs from her, and the littermates of my girls, have endured. But there have been enough that I finally decided it was time to look elsewhere. Since this breeder was the president of the regional Poodle club for many years, I was disappointed that she chose not to follow the guidelines recommended for those who are trying to diversify the gene pool in Poodles, in hopes of producing a healthier dog, but to each their own. But back to being politically incorrect. Many breeders of solid colored, gorgeous show quality Standard Poodles will immediately eliminate any dog from the gene pool if that dog has even a touch of white hair on his chest, much less has what some call "multi-colors". Some breeders will even "bucket" any puppies from their breeding who are mismarked--yes, that's right, they will cull them, a/k/a kill them, the moment they are born. This makes me incredibly sad. Unless there is something negatively connected to a certain color gene (like the lethal white gene that can show up in merle to merle breedings in Aussies and Collies) then there is absolutely no reason to kill a puppy because of its color. In fact, when you do so, you may be killing a dog that has exceptionally GOOD genes for soundness in body and mind...perhaps even a dog that could, technically, change the future of the breed. When I met Charlene Dunlap of Canine Horizons, a Poodle fancier who is a fantastic dog trainer but is not a dog breeder, I learned a lot about parti colored Poodles. In fact, her Canine Horizons website contains a wealth of information, including photos that prove that Poodles who were basically white with black spots were some of the original dogs that this lovely breed were founded on. The first time I ever stepped out of the box and brought a parti colored Poodle home, it was on impulse. I named him, on his registration papers, Paint Me Politically Incorrect. He had a wonderful temperament and was an incredibly sweet dog whom I placed with a great family. As you can see in this photo, "Pete" was a very pretty dog with beautiful markings, but he was not a very elegant Poodle, in fact he was only five months old in this photo...he continued to grow and grow! He lacked the elegance needed in a correct Poodle head and he was heavy boned, almost to the point of being more like a Labradoodle than a Poodle. I have to admit, I still found him quite beautiful even though I decided, as he grew (and grew and grew!) and I researched his pedigree, I knew he was destined for a pet home, not to be used for breeding. My Kate is getting older now, and having lost her sister a few years ago, as well as a sweet Standard boy that we had taken in when his owner died, our house had began to feel a bit "Poodle empty". So when I found out that the United Kennel Club allowed multi-colored Poodles not only to be shown in the conformation ring, but also to be show in the sporting clips (as opposed to AKC shows where they must have much more extensive grooming, particularly after they are a year old)....I decided to look for a Poodle who could be competitive in the UKC ring. Two different breeders offered us lovely black females to show UKC, but we decided to hold out for a male. Imagine our surprise about a month ago when we received a call asking if we would like to add a lovely 7 month old parti-colored male to our household. And not one with a questionable pedigree, but a dog from a reputable breeder, and a dog with the structure, type and movement capable of winning in the show ring! So go ahead....paint me politically incorrect! If what it takes, to find diversity in Poodles is to take a chance on something other than just a standard black, then I vote for diversity. It is time to put color aside, and breed for good health, so we can stand a chance at saving the breed we love. But keep in mind, being a parti-color does NOT mean that the dog has an outcrossed pedigree (in fact you can look up Pete's pedigree and see that it is heavily linebred). It is more important than ever, if looking for a parti-colored Poodle, to deal with a reputable breeder, one who will show you the health clearances of the parents! We are already in love with our boy Hudson, who is quite a character. We wish for not only a sucessful show career, but also for a long, happy, HEALTHY life for our new boy. (c) 2013, Melanie Schlaginhaufen, all rights reserved. No portion of this article, including photos, may be reproduced without the author's permission.